It's not to give at least half of your money away, although that's something Gates did pledge to do. It's not to be a patient investor. And it's definitely not to memorise employee license plates to see who is still working; Gates came up with that on his own. 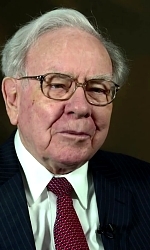 But I prefer to think of it as Buffett's process - because that means we can all take a page from the Buffett playbook. Simplifying - boiling things down, working on things that really count - is almost always the best path to success. Then focus - consistently and relentlessly - on doing the one or two things that really matter.